NOTICE: Activation key must be used on a valid Steam account. Requires an internet connection. About the game Awoken after centuries of slumber, weakened and yearning for release from his immortal bonds, Dracula must reclaim his powers and make a pact with Death, to defeat Satan and gain eternal rest. Blood is everything as Dracula faces both his nemesis and his descendant’s uny… ielding quest for revenge, in this final, dramatic battle between good & evil. An epic fantasy adventure set in an expansive, modern-day world. Play as Dracula and discover the ultimate fate behind the ‘Lord of Shadow’ himself! Key Features Become the ultimate villain Play as Dracula for the first time! Collect all of the vampire lord's deadly powers and abilities. Discover new Lords of Shadow environments Enter a world of deep exploration within a modern day setting and the massive labyrinthine corridors of Dracula's castle. Utilize powers of the great vampire lord Master Dracula's vampiric aspects for deep strategic combat and devastating evil powers! Dominate your adversaries with new abilities Transform into mist, glamour and control enemies and disappear into the dark unseen. Navigate through elaborate environments and boss battles Traverse through levels using new platforming mechanics and massive Titan fights that utilize real time physics for on the fly player choice. Drink blood for eternal strength Intensify your immortal powers by drinking the blood of your enemies. Blood fuels your abilities! System Requirements Windows - Minimum OS : Windows XP Service Pack 3 Processor : 2.4Ghz Intel Core 2 Duo or AMD equivalent Memory : 2 GB RAM Hard Drive : 10 GB available space Graphics : Direct X9 compatible video card 512Mb RAM DirectX : Version 9.0c Sound : DirectSound supported with Direct X9.0c or better Broadband : Broadband Internet connection Additional notes : Keyboard & Mouse Windows - Recommended OS : Windows 7 or higher Processor : Quad Core CPU Memory : 2 GB RAM Hard Drive : 10 GB available space Graphics : Direct X11 compatible video card with 1024Mb RAM DirectX : Version 9.0c Sound : DirectSound supported with Direct X9.0c or better Broadband : Broadband Internet connection Additional notes : For the best experience we highly recommend using a XInput compatible Gamepad. © 2014 KONAMI Digital Entertainment. 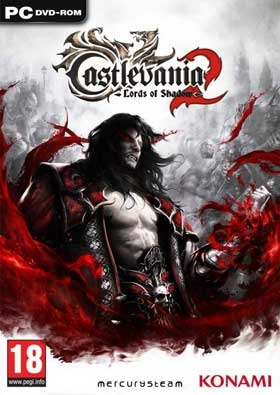 “Castlevania and Lords of Shadow are trademarks or registered trademarks of Konami Digital Entertainment Co., Ltd. KONAMI is a registered trademark of KONAMI CORPORATION. Uses Bink Video. Copyright © 1997-2014 by RAD Game Tools Inc. FMOD sound and music system, copyright © Firelight Technologies, Pty Ltd. 1994-2014. Lua 5.1 Copyright © 1994-2014 Lua.org, PUC-Rio. NVIDIA and PhysX, both stylized and non-stylized, are trademarks or registered trademarks of NVIDIA Corporation. Copyright 2014 NVIDIA Corporation. Dolby and the double-D symbol are trademarks of Dolby Laboratories. ©2014 Valve Corporation. Steam and the Steam logo are trademarks and/or registered trademarks of Valve Corporation in the U.S. and/or other countries.All other copyrights or trademarks are the property of their respective owners and are being used under license. Created and developed by Mercury Steam Entertainment s.l. and published by KONAMI. Unauthorized copying, adaptation, rental, lending, re-sale, arcade use, charging for use, broadcast, cable transmission, public performance, distribution or extraction of this product or any trademark or copyright work that forms part of this product is prohibited.